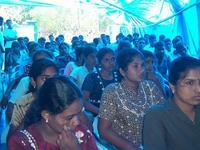 Tamil Rehabilitation Organization (TRO) provided financial aid to fifty nine undergraduate students from Amparai district attending Peradeniya, Jaffna and Eastern Universities who were affected by the tsunami disasater in an event held at TRO officies in Thirukovil Monday 10 am, sources from the eastern district said. Local teacher Gunapalan presided the event. 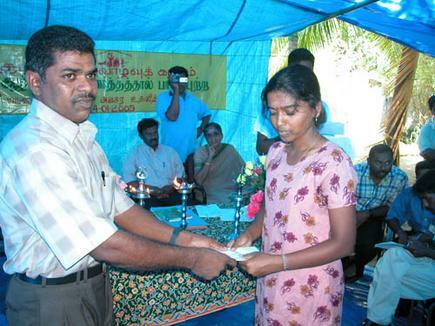 Thrikovil district education commissioner lit the ceremonial lamp at the beginning of the event. Gunapalan, addressing the audience said that for the students who were financially strapped and were struggling to continue studies TRO's gesture has provided confidence and hope for their future. Batticaloa-Amparai district LTTE commander Ram, Amparai district LTTE Head of Political section, Kuyilinban, Amparai district TRO Director, Athavan, Head of LTTE Women's Politicial Wing, Thamilini, and Tamil Eelam Health Service official, Thanikai, presented the awards to the student recipients. ''Amparai has been badly hit by the tsunami and a large number of students have been severely affected in this district. We applaud the TRO for identifying the needs of these students and coming forward to help them during these difficult times. We hope they will continue to assist needy students. I also wish the students success in their studies,'' said Col.Ram when he addressed the audience. Athavan and Thamilini also spoke.